(NORTH BAY, ONT.) 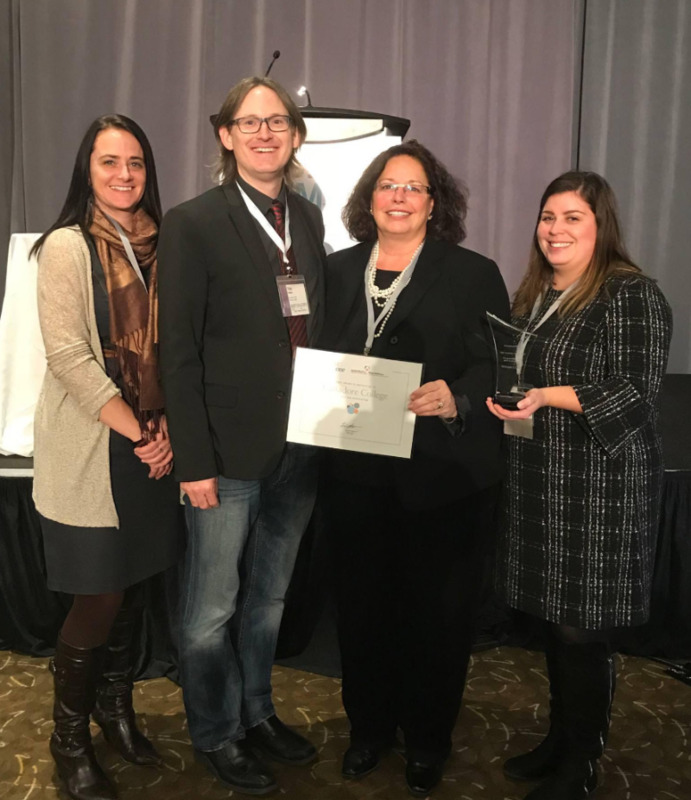 – Last month, Canadore College was acclaimed a national SIM Innovator Award winner at the 2017 SIM Expo hosted by SIM-one. Canadore was one of seven organizations to receive the prestigious award, which recognizes Canadian organizations demonstrating groundbreaking work and exceptional commitment to innovate, advocate and advance simulation for education, patient safety or quality improvement. In particular, the College was chosen for the breadth and depth of their simulation program, including a focus on Indigenous health. The School of Health, Human Care and Wellness strongly believes in the use of simulation as an innovative approach to support the teaching and learning needs of all students and to positively contributing to building employee capacity. Moreover, the use of simulation facilitates collaboration and respectful relationships that model how cross-functional teams of health care professionals work in the system to improve patient and client outcomes. Canadore College is known as a forerunner in postsecondary in the use of simulation, having recently garnered a grant from the Canadian Institutes of Health Research (CIHR) to undertake a research project that utilizes culturally-relevant learning simulations through human participants to improve interprofessional collaboration amongst various healthcare providers with a particular focus on working with Indigenous populations living and coping with cancer. Simulation in teaching will also be at the foundation of the College’s new health and wellness facility, The Village, a ground-breaking approach to educating the next generation of our country’s health and wellness professionals, with a model that does not currently exist anywhere else in Canada. The new space is designed to celebrate traditional Indigenous knowledges and practices with culturally-appropriate spaces, services and supports promoting inclusiveness, understanding and the spirit of coming together. The Village will excel in collaborative interprofessional education while integrating Indigenous, Eastern and Western practices in complementary ways. The 2017 SIM Expo was held in Mississauga, Ont. and is hosted by SIM-one and is Canada’s premier healthcare simulation event for the simulation community to unite, showcase innovations, share knowledge, and advance best practices. SIM-one / Canadian Network for Simulation in Healthcare (CNSH) is a not-for-profit organization that connects the simulation community, facilities, and resources across Canada and beyond. SIM-one advocates for and advances simulated learning in health professions education for the benefit of patient care and safety. Photo caption, left to right: Louise Moir, nursing technologist/simulationist at Canadore College; Timothy Willett, president and chief executive officer at SIM-one; Letitia Nadalin-Penno acting dean of the School of Health, Human Care and Wellness at Canadore College; and Amberleigh Kelly, nursing technologist/simulationist at Canadore College.